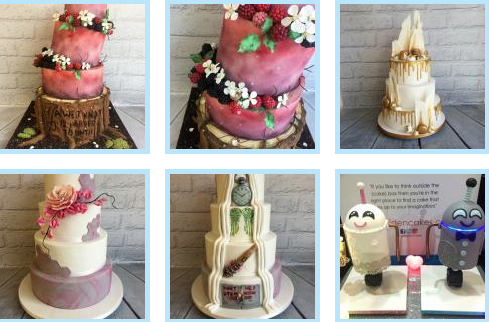 Here at Ice Maiden Cakes Ltd we just love the colourful and the quirky, the random and the retro, the cheeky and the charming. We can make your cake light up, we can make it sing, we can make it interactive and, above all, we can make it tasty! So if you like the think outside the (cake) box then you're in the right place to find a cake that lives up to your expectations. Baking is in our bones and we believe there's no point in having an awesome looking cake if it doesn't taste sublime. Our cakes are baked fresh for each order with free range eggs and locally sourced ingredients wherever possible. Maybe we can tempt you with our totally tropical coconut cake with zingy lime curd; or go old-school with our cherry bakewell - a delicious almond sponge with a luxurious cherry conserve; and of course, once you've had our famous chocolate fudge cake, you'll never settle for another chocolate cake again!